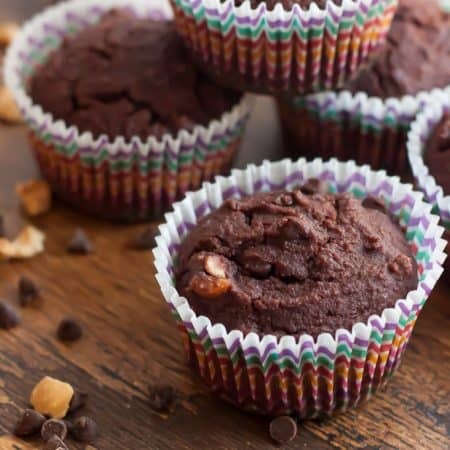 These Gluten-Free Chocolate Hazelnut Muffins taste just like Nutella, and are grain-free, dairy-free, and refined sugar-free! Like many people, I am a huge fan of Nutella. I think that the combo of chocolate and hazelnut is a match made in heaven! 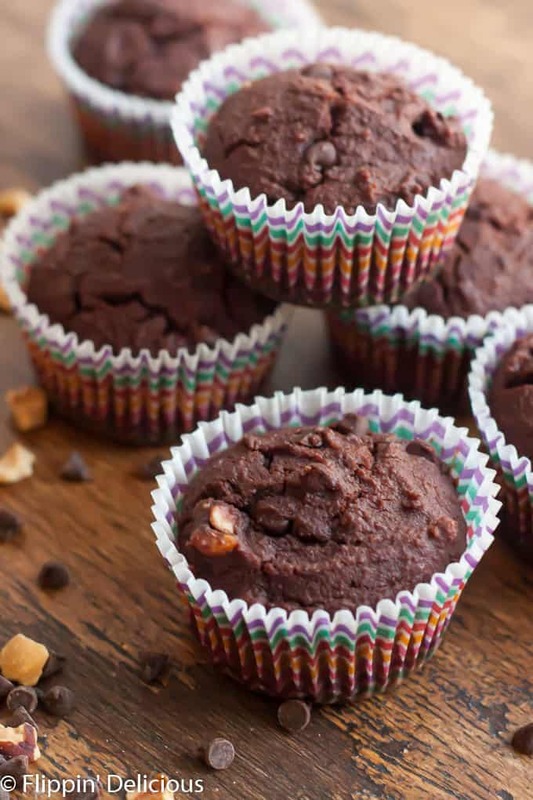 These gluten-free chocolate hazelnut muffins are no exception. I started working at Dion’s the end of last year. I’ve really been enjoying my day-job and that it has allowed me to let Flippin’ Delicious become a hobby again. It is so much more fun to develop recipes, photograph cookies, and eat them now that the pressure of it being my “job” has been removed. 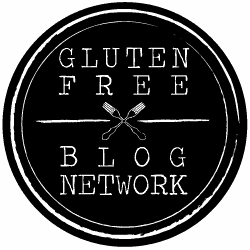 I was just burnt out, churning out so many recipes. Now I get to bake “for fun” and then when the results are scrumptious I can’t help but share the recipe with you. When it was my boss’s birthday, I volunteered to make cupcakes to share with our team. She was training for a marathon at the time so I didn’t want to bring cupcakes that would throw her off track. 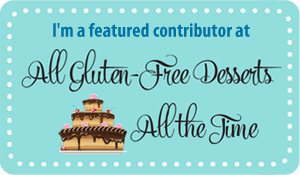 I LOVE my friend Chrystal’s (Gluten-Free Palate) Gluten Free Double Chocolate Muffins. 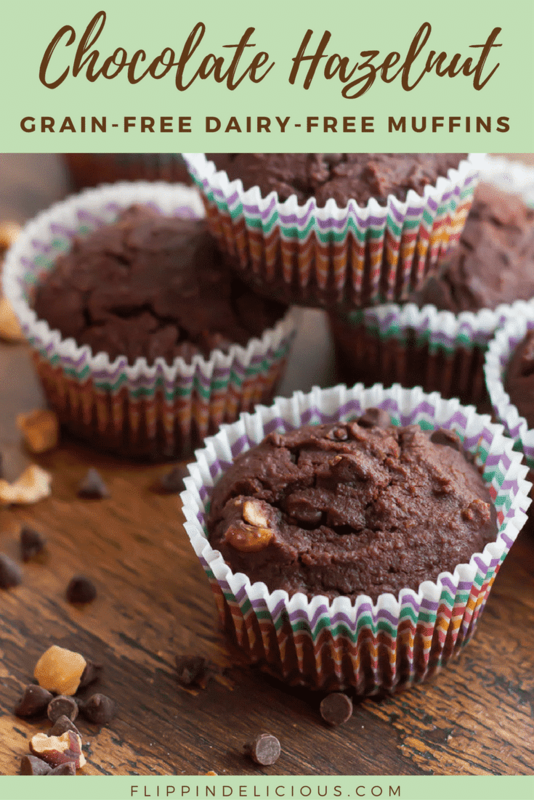 They are grain-free, dairy-free, and except for the chocolate chips, they are refined sugar-free. 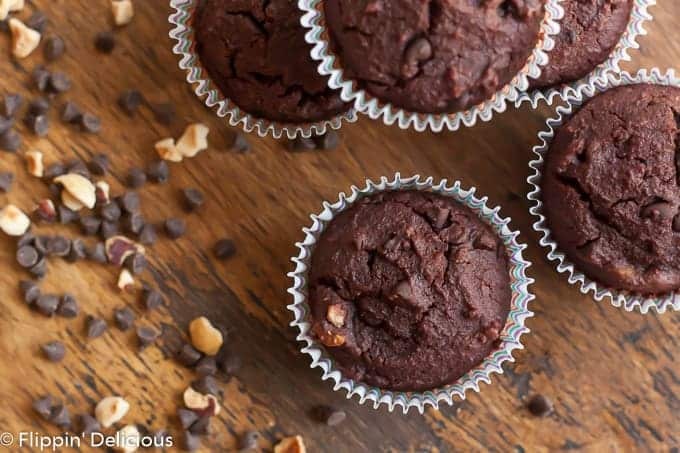 I adapted Chrystal’s recipe to make these moist Nutella-inspired grain free chocolate hazelnut muffins. To turn them into “healthy” Nutella cupcakes I topped some of them with a swirl of Nutella, and I frosted the rest of them with a mixture of whipped cream cheese, Nutella, cocoa powder, and honey. And of course, some sprinkles. Naturally, as an ambassador for Rodelle, I used their Gourmet Baking Cocoa and Gourmet Vanilla Extract in this recipe. As always, all opinions are entirely my own. I am an ambassador for Rodelle because I LOVE their products and always have them stocked in my kitchen. 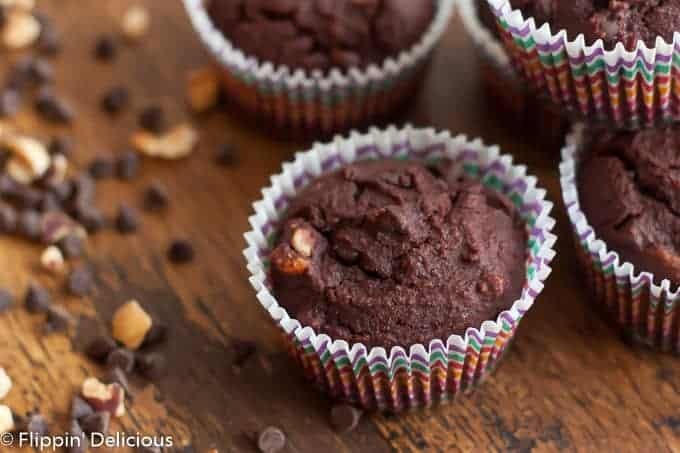 Whether you made these grain-free muffins for a guilt-free treat, or indulgent breakfast they will disappear quickly. Top them with a swirl of Nutella if you feel like being just a little bit naughty. Preheat the oven to 350°F and line your muffin tin with paper liners. In a large mixing bowl, whisk together the coconut oil, maple syrup, and eggs. Add the almond flour, cocoa powder, salt, and baking soda and mix until well combined. Dissolve the instant coffee in the vanilla extract. Stir in the chocolate chips, hazelnuts, vanilla extract into the batter. Fill each muffin liner approx ¾ full, and bake for 18-20 minutes, or until a toothpick inserted near the center comes out clean. Let cool 5-10 minutes before eating, or cool completely if you intend to frost them into cupcakes. These look so tasty! 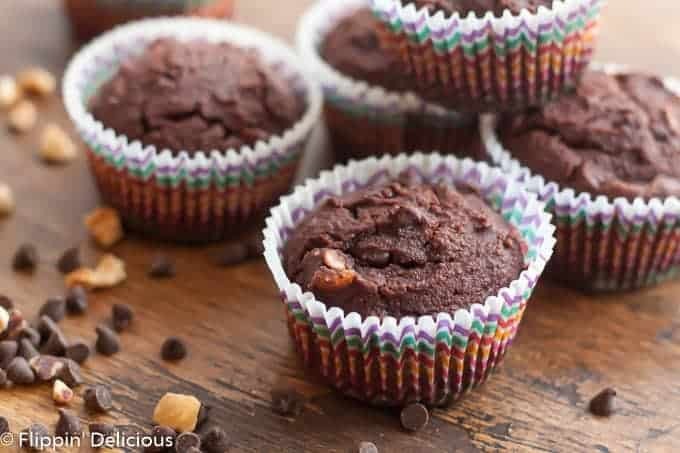 I love chocolate muffins and I’m sure the hazelnuts really take them up a notch! These look delightful! I always feel so much better when I eat healthy, but it’s a struggle for me because I have a HUGE sweet tooth! Can’t wait to satisfy that with these yummy muffins. Those look delicious! 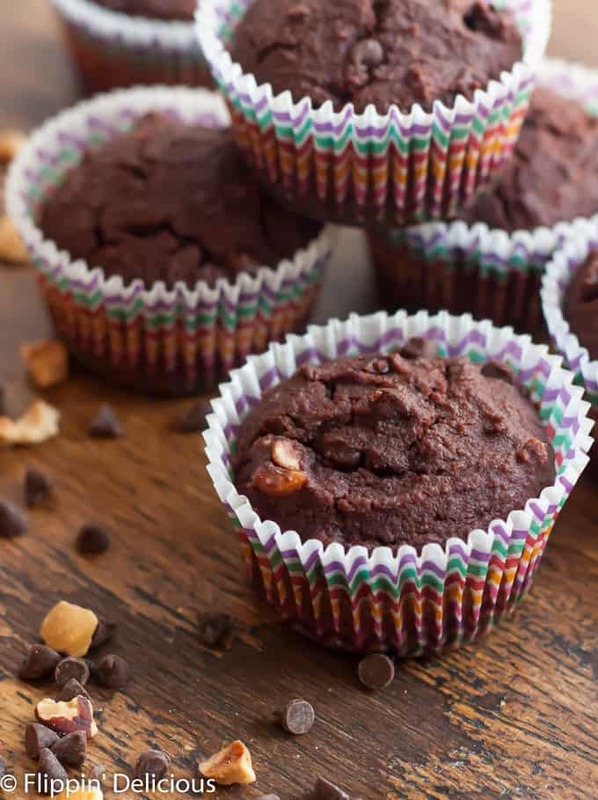 You really can’t go wrong with a grain-free muffin. 😉 Chocolate and hazelnuts are a great combo, too! LOVE this flavor combo! I wish my oven would surprise me this morning and greet me with these already baking in the oven. That would be a brilliant surprise! These muffins look fantastic, can’t wait to try them out! These look and sound divine. If my boys could do nuts, I’d be ALL OVER this. Thanks Kathleen. I hope you enjoy them! I am making these now and see the vanilla and coffee/espresso in the ingredients. I am going to assume they just go in with the batter and hope for the best. It just doesn’t say in the instructions. I cannot find where to subscribe. Unfortunately, mine came out an unmitigated disaster. Granted, I used MCT Oil and Cacao powder instead of regular coconut oil and cocoa powder. It came out a dry, lumpy mess. I mixed it by hand as recommended in the comments. I’m sorry that it didn’t turn out for you. Unfortunately, baking is finicky by nature and substituting ingredients can be unpredictable. I haven’t baked with MCT Oil or Cacao powder enough to know what adaptions you should make if you are substituting them. I’ve never had this recipe come out dry. It us usually a batter that is thick, smooth, and a bit oily. Which liquid sweetener did you use?